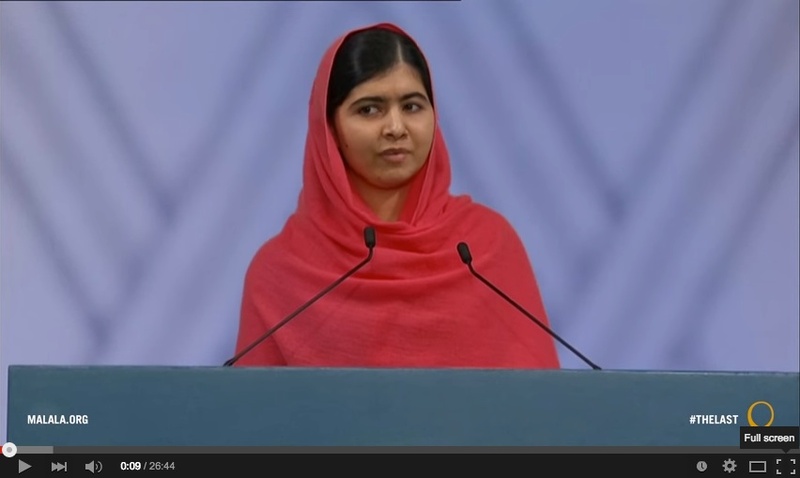 Malala Yousafzai’s Nobel Prize speech, 2014. Click on image to see the speech. In recent years, there has been a resurgence of interest in open learning, mainly related to open educational resources and MOOCs. Although in themselves OER and MOOCs are important developments, they tend to cloud other developments in open education that are likely have even more impact on education as a whole. It is therefore necessary to step back a little to get a broader understanding of not just OER and MOOCs, but open learning in general. This will help us better understand the significance of these and other developments in open education, and their likely impact on teaching and learning now and in the future. Each of these developments is discussed in more detail below, except for MOOCs, which are discussed extensively in Chapter 5. Open education is primarily a goal, or an educational policy. An essential characteristic of open education is the removal of barriers to learning. This means no prior qualifications to study, no discrimination by gender, age or religion, affordability for everyone, and for students with disabilities, a determined effort to provide education in a suitable form that overcomes the disability (for example, audio recordings for students who are visually impaired). Ideally, no-one should be denied access to an open educational program. Thus open learning must be scalable as well as flexible. State-funded public education is the most extensive and widespread form of open education. For example, the British government passed the 1870 Education Act that set the framework for schooling of all children between the ages of 5 and 13 in England and Wales. Although there were some fees to be paid by parents, the Act established the principle that education would be paid for mainly through taxes and no child would be excluded for financial reasons. Schools would be administered by elected local school boards. Over time, access to publicly funded education in most economically developed countries has been widened to include all children up to the age of 18. UNESCO’s Education for All (EFA) movement is a global commitment to provide quality basic education for all children, youth and adults, supported, at least in principle, by 164 national governments. Nevertheless today there are still many millions of ‘out-of-school’ children worldwide. Access to post-secondary or higher education though has been more limited, partly on financial grounds, but also in terms of ‘merit’. Universities have required those applying for university to meet academic standards determined by prior success in school examinations or institutional entry exams. This has enabled elite universities in particular to be highly selective. However, after the Second World War, the demand for an educated population, both for social and economic reasons, in most economically advanced countries resulted in the gradual expansion of universities and post-secondary education in general. In most OECD countries, roughly 35-60 per cent of an age cohort will go on to some form of post-secondary education. Especially in a digital age, there is an increasing demand for highly qualified workers, and post-secondary education is a necessary gateway to most of the best jobs. Therefore there is increasing pressure for full and free open access to post-secondary, higher or tertiary education. However, as we saw in Chapter 1, the cost of widening access to ever increasing numbers results in increased financial pressure on governments and taxpayers. Following the financial crisis of 2008, many states in the USA found themselves in severe financial difficulties, which resulted in substantial cuts to the U.S. higher education system. Thus solutions that enable increased access without a proportionate increase in funding are almost desperately being sought by governments and institutions. It is against this background that the recent interest in open education should be framed. As a result, open is increasingly (and perhaps misleadingly) being associated with ‘free’. While the use of open materials may be free to the end user (learners), there are real costs in creating and distributing open education, and supporting learners, which has to be covered in some way. Thus a sustainable and adequate system of publicly funded education is still the best way to ensure access to quality education for all. Other forms of open education are steps towards achieving fully open access to higher education. In the 1970s and 1980s, there was a rapid growth in the number of open universities that required no or minimal prior qualifications for entry. In the United Kingdom, for instance, in 1969, less than 10 per cent of students leaving secondary education went on to university. This was when the British government established the Open University, a distance teaching university open to all, using a combination of specially designed printed texts, and broadcast television and radio, with one week residential summer schools on traditional university campuses for the foundation courses (Perry, 1976). The Open University started in 1971 with 25,000 students in the initial entry intake, and now has over 200,000 registered students. It has been consistently ranked by government quality assurance agencies in the top ten U.K. universities for teaching, and in the top 30 for research, and number one for student satisfaction (out of over 180). It currently has over 200,000 registered students. However, it can no longer cover the full cost of its operation from government grants and there is now a range of different fees to be paid. There are now nearly 100 publicly funded open universities around the world, including Canada (Athabasca University and Téluq). These open universities are often very large. The Open University of China has over one million enrolled undergraduate students and 2.4 million junior high school students, Anadolou Open University in Turkey has over 1.2 million enrolled undergraduate students, the Open University of Indonesia (Universitas Terbuka) almost half a million, and the University of South Africa 350,000. These large, degree awarding national open universities provide an invaluable service to millions of students who otherwise would have no access to higher education (see Daniel, 1998, for a good overview). It should be noted however that there is no publicly funded open university in the USA, which is one reason why MOOCs have received so much attention there. The Western Governors’ University is the most similar to an open university, and private, for-profit universities such as the University of Phoenix fill a similar niche in the market. As well as the national open universities, which usually offer their own degrees, there is also the OERu, which is basically an international consortium of mainly British Commonwealth and U.S. universities and colleges offering open access courses that enable learners either to acquire full credit for transfer into one of the partner universities or to build towards a full degree, offered by the university from which most credits have been acquired. Students pay a fee for assessment. Open, distance, flexible and online learning are rarely found in their ‘purest’ forms. No teaching system is completely open (minimum levels of literacy are required, for instance). Thus there are always degrees of open-ness. Open-ness has particular implications for the use of technology. If no-one is to be denied access, then technologies that are available to everyone need to be used. If an institution is deliberately selective in its students, it has more flexibility with regard to choice of technology for distance education. It can for instance require all students who wish to take an online or blended course to have their own computer and Internet access. It cannot do that if its mandate is to be open to all students. Truly open universities then will always be behind the leading edge of educational applications of technology. Despite the success of many open universities, open universities often lack the status of a campus-based institution. Their degree completion rates are often very low. The U.K. OU’s degree completion rate is 22 per cent (Woodley and Simpson, 2014), but nevertheless still higher for whole degree programs than for most single MOOC courses. Lastly, some of the open universities have been established for more than 40 years and have not always quickly adapted to changes in technology, partly because of their large size and their substantial prior investment in older technologies such as print and broadcasting, and partly because they do not wish to deny access to potential students without the latest technology. Thus open universities are now increasingly challenged by both an explosion in access to conventional universities, which has taken up some of their market, and new developments such as MOOCs and open educational resources, which are the topic of the next section. 1. Should access to post-secondary or higher education be open to everyone? If yes, what are reasonable limitations on this principle? What should be the government’s role, if any, in making this possible? If your answer is no to the first part of this question, why should education up to post-secondary education be open, but not afterwards? Is it simply money, or are there other reasons? 2. Are open universities still relevant in a digital age? 10.1 Open learning by Anthony William (Tony) Bates is licensed under a Creative Commons Attribution-NonCommercial 4.0 International License, except where otherwise noted.